The two companies I would be looking at on how internet is used in each organisation, the first company I would be looking at is Amazon is a US-based multinational electronic commerce company. It is the largest online retailer in the United States, with nearly three times the Internet sales revenue of the runner up. 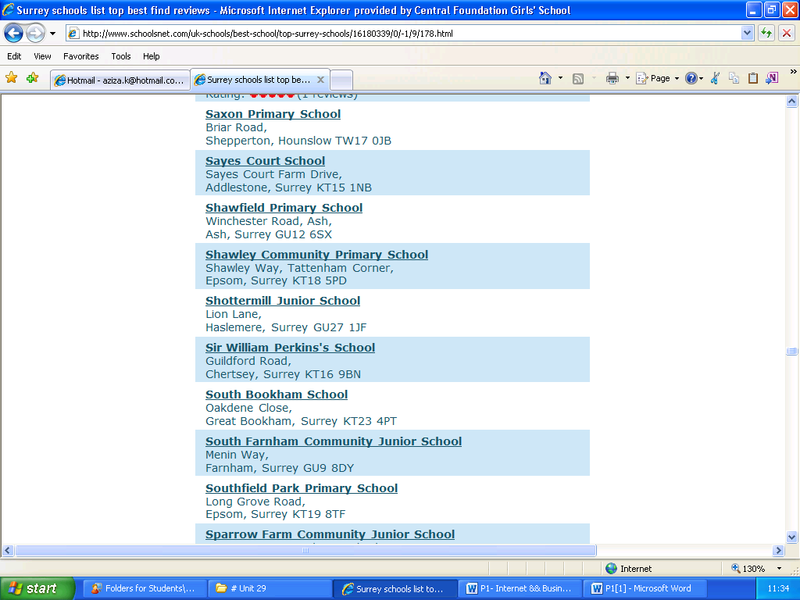 My second organisation I would be looking at on how the internet used is Sir William Perkins's School is a British independent day school for girls aged 11 to 18 in Chertsey, Surrey. Amazon has to buy products such as computers for their company also they will have to buy equipment for their business such as electricians, books etc. Amazon would have to find new suppliers over the internet by this it would help them find a cheap and great deal. 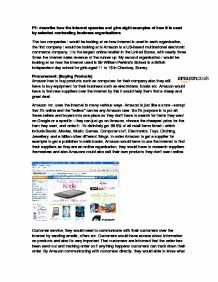 Amazon Inc. uses the internet in many various ways. 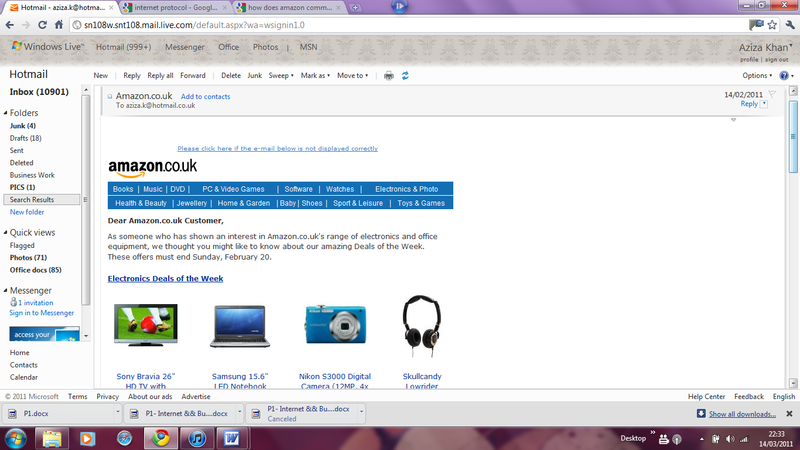 Amazon is just like a store - except that it's online and the "sellers" can be any Amazon user. So it's purpose is to put all these sellers and buyers into one place so they don't have to search for items they want on Google or a specific - they can just go on Amazon, choose the cheapest price for the item they want, and order it. It's definitely got 99.9% of all retail items listed - which include Books, Movies, Music, Games, Computer stuff, Electronics, Toys, Clothing, Jewellery, and a billion other different things. 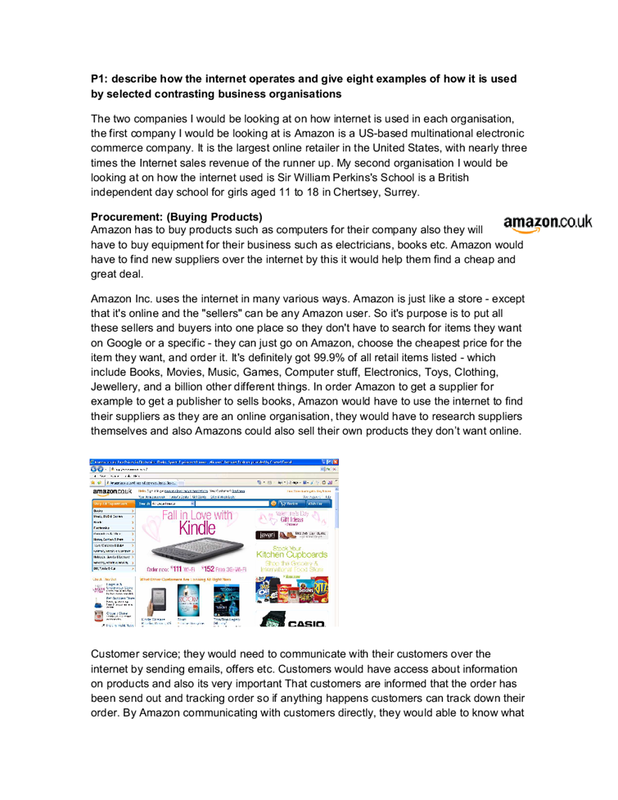 In order Amazon to get a supplier for example to get a publisher to sells books, Amazon would have to use the internet to find their suppliers as they are an online organisation, they would have to research suppliers themselves and also Amazons could also sell their own products they don’t want online. Customer service; they would need to communicate with their customers over the internet by sending emails, offers etc. Customers would have access about information on products and also its very important That customers are informed that the order has been send out and tracking order so if anything happens customers can track down their order. By Amazon communicating with customers directly, they would able to know what the customer would think about their business and service they are providing. If Amazon knows there's an issue with what they are offering, technology, customer base, or competitors, they can deal with it. The sooner they identify a problem, the more quickly it can be respond to it. After observing the customers remarks about the business and service later they would try to improve the service effectively and efficient as possible. 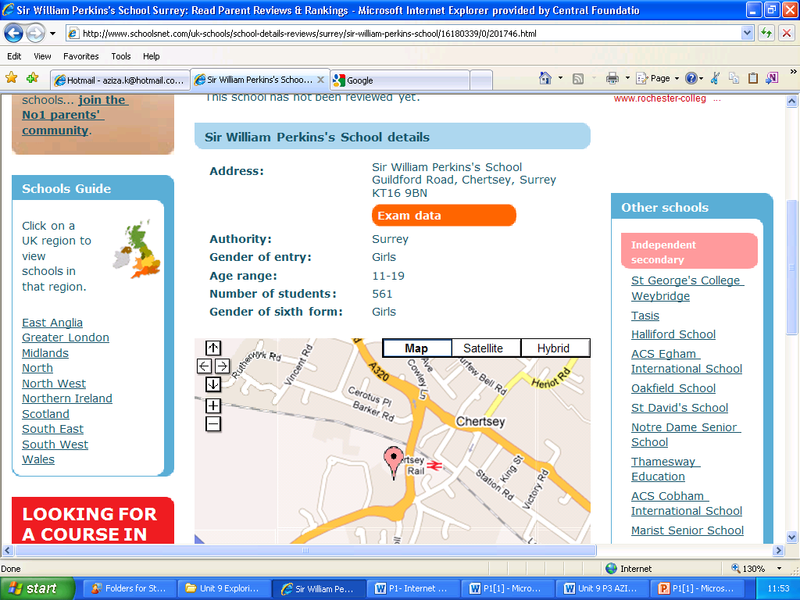 Sir William Perkins's School is a British independent day school for girls aged 11 to 18 in Chertsey, Surrey. 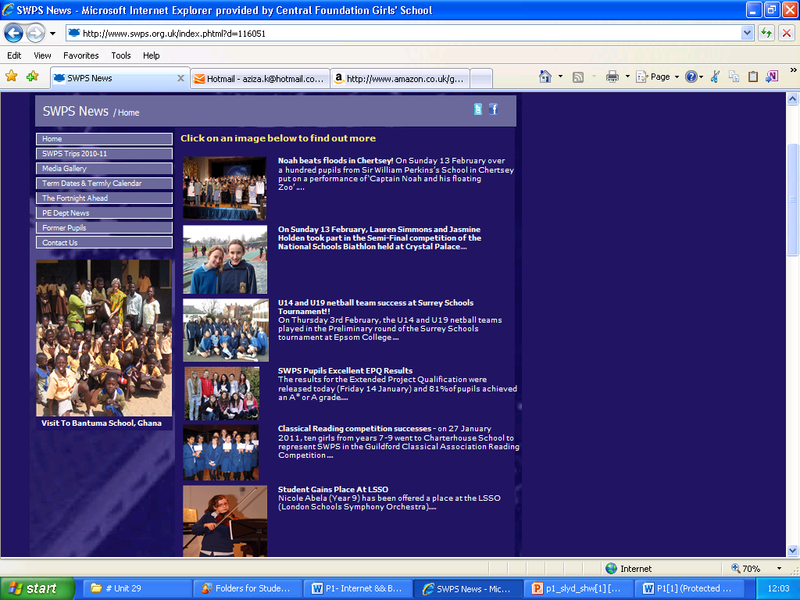 The way SWPS use the internet to interact and communicate with customers is by provide information about the school for existing pupils and parents as well as potential ones, also it provides contact details and email contact to the school's administration. They have newsletters, school brochures and other documents and also displaying children's work celebrating the successes of children and the school. SWPS do not sell products as they are a secondary school. So they would buy products from other companies over the internet for the school such as computers, desks, stationeries etc. they would research for a better deal so its saves a lot of money for the school and compare their suppliers to check which ones better. Public relations professionals use many different techniques as part of their PR campaigns. It is also from the media relations and lobbying, to speaking at conferences, to online campaigns, to sponsorship - and more. PR isn't always about short-term campaigns, such as product launches. It can encompass longer-term strategic aims, such as brand building and working with local communities. 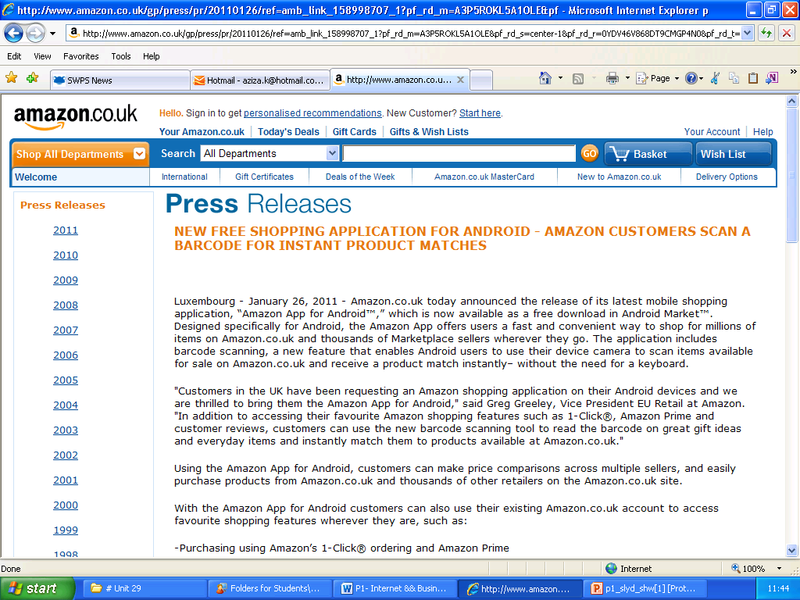 Amazon also uses press release to give out latest news for customers about the business and products. SWPS uses press releases as to show customers how good their school is by showing them what they have achieved and what activity holds within the school. 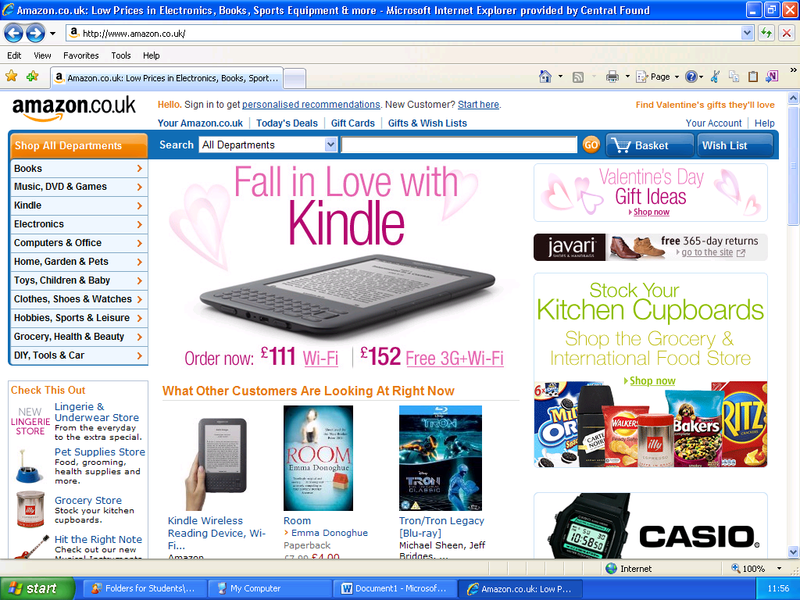 Amazons advertise their products on other websites so other people can be aware of promotions and new deals that amazon are advertising. Once you have brought something from the Amazons website with your contact details they would keep sending you emails about new products they have released and also new and improved products. 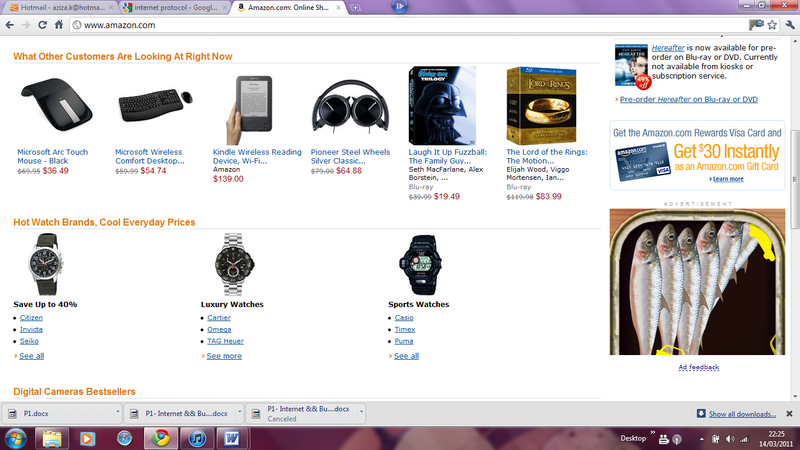 Also Amazon also advertises their products public sites such as social networks like Facebook, MySpace, Twitter Etc. As it’s a Private school SWPS don’t advertise their school anywhere else, however if you do go to surrey school website they do have a brief information about the school and link to the website. Amazon would check and research about their competitors, as for example they might look up on Ebay to find out what products they are selling or what they are pricing for the customer, by this Amazon would known what their competitors are doing and they can improve their service to gain more customers than others. Also they could research on about their suppliers as this is because in order to purchase books they do need to find the authors names and publisher so they would known who to order from. Sir William Perkins do research about other Secondary Private this would help them on what other secondary school in Surrey are doing, by this it would help them to improve their school as they can stand out this might convenience parents to choose their school as there is big competitive around surrey as their many private schools around would have to make sure there are on top then other schools in surrey. 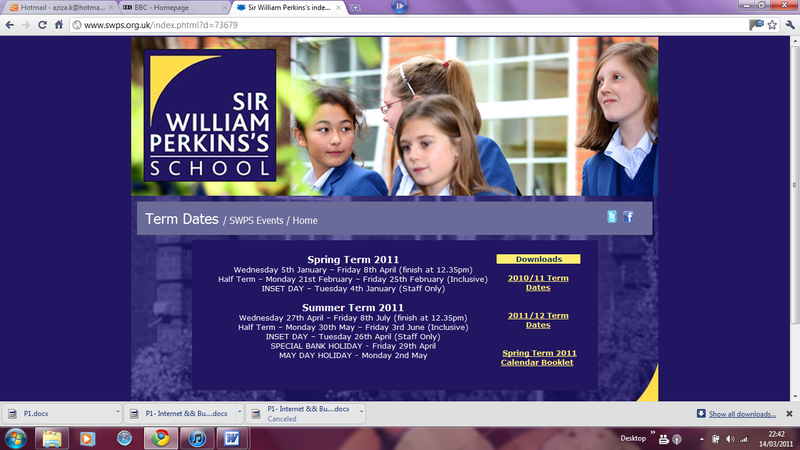 Online Presence for Sales Sir William Perkins do not use their school websites to sell any products to the parents of the children as it is a school so they use it that service in to provide information about the school and students. 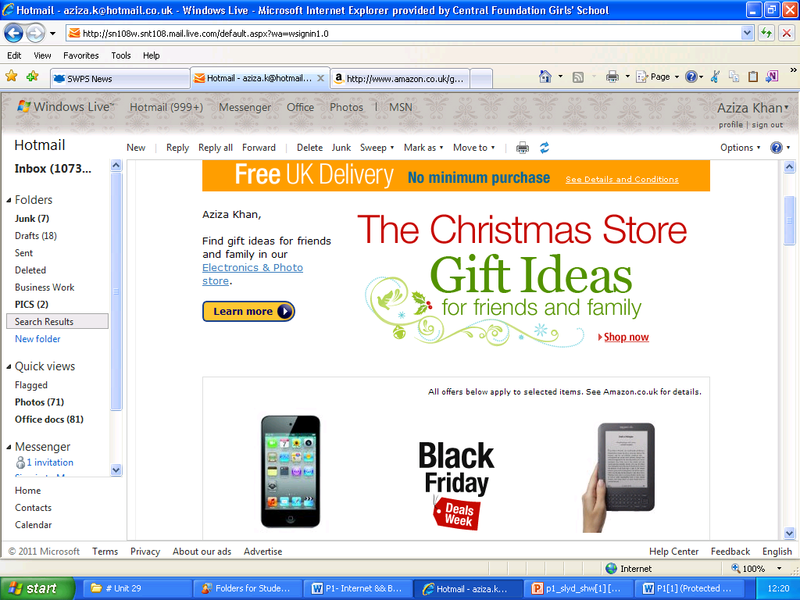 So they wouldn’t be selling the school uniform online on their website so parents would have to go to the stores. Amazon as they are multinational electronic commerce company, so they sell their products online, they are online retailer of books, movies, music and games along with electronics, toys, apparel, sports, tools, groceries and general home and garden items etc. Amazon communicate with customers in many different ways, when a customer has purchased something from Amazon they inform customers about their latest products and deals through email, letter and even calling them and which this is showing they still want to keep their existing customers. Sir William Perkins use communication by providing information about the school letting the parents known when the term is starting or what events is running for example parents evening and also the dates and time when the school opens and closes. They also have email address so whenever a parent wants a quick discussion with a teacher about their child or something to with the school they can quickly email them without having a meeting which is fast and quick. E-commerce in Business Companies of Bangladesh. - 10 million active - Clubcard magazine is now the largest circulation magazine in the country. Weaknesses of Clubcard - Lot of research must be conducted regularly to see competitors' activity. - ICT is very important to clubcard system, it would not be feasible to run it manually, and therefore employees must be trained accordingly. how successful Tesco had become, therefore they try their best to keep on the same track as Tesco since they're the nation's no.1 leading supermarket. Tesco's online presence has helped its business to achieve its aims and objectives in certain areas, the main aim of a business is to make a profit, and the website is fulfilling its duties. to avoid the risk of collecting demurrage at a foreign port in case the quota has been exhausted. BGMEA can play a vital role in authentication of buyers and sellers through encryption method. Authentication by BGMEA can ensure the confidence of the importers regarding the genuineness of the manufacturers. 'Coca-Cola' change theirs to suit the packaging in relation to the offer or perhaps an event. This attracts more customers with the sense of a key message. An example could concern a sales clearance with big headings and bold lettering to point out the offer or the key message. Therefore, Quiz is receiving profit from customers. If the business sells online, this will save them general utility costs such as electricity and heating bills. They could also save on employment costs, as less people will be needed in-store. Usually to help run a high-street store like Quiz, a lot of people will be needed for various jobs.